My job keeps me busy and like most of us, the day is made up of pieces. Move through the routine, start something new, fix a problem, talk about TV shows. Every once in a while something about work just feels fantastic. I’ll have an interesting conversation with a reporter, this summer’s super intern turns in professional work, a former student touches base to share some success, or an idea that started in my head takes shape and adds value to all that we do. 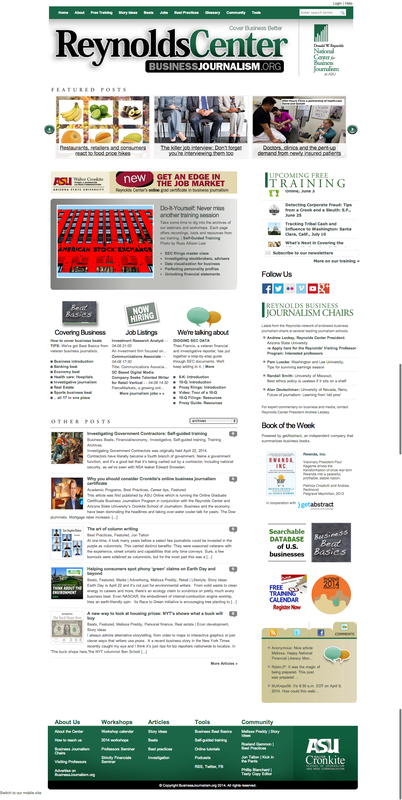 This morning, I just love our homepage at BusinessJournalism.org. I’ll share it here. | And here’s another in early 2014. | And another in February 2014. What I like about these are the way they look, of course, but also how full they are of information that is useful for business journalists. | The images below are what we call Trending Topic packages, resources and ideas that might help a reporter covering business. BusinessJournalism.org April 2010, soon after the relaunch.